Eating out in Japan without speaking much (/ any) Japanese or being able to read Kanji characters can be tricky. Often we'd limit ourselves to places with pictures on the menu or plastic models of the food that we could point to. One place that ticked all the right boxes in terms of ease, tastiness and feeling like a uniquely Japanese experience was Uobei 'Genki Sushi'. We visited one branch in Hakata, Fukuoka (5th floor of Yodobashi electronics store, map) and one in Shibuya, Tokyo (map). It looks like there's quite a few other locations, but my Japanese isn't up to the job of reading their website. 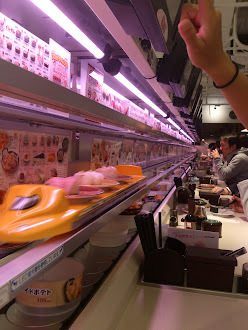 Uobei follow the 105 Yen kaiten sushi ("conveyor belt") model. 105 Yen (100 pre-tax) per plate is _cheap_ for sushi, and no doubt more sophisticated sushi eaters would choose somewhere more up market, but for the novice Japan visitor, it's a great experience. Differing from regular conveyor belt sushi, Uoebi provide touch screen menus (English option available) from which you can place orders directly with the kitchen. Moments later, your sushi shoots along a set of rails and stops right in front of you. In the Hakata branch, the plastic trays are even modelled as mini Shinkansen bullet trains. As well as a decent selection of nigiri and gunken sushi, there's quite a few cooked options (tempura-style prawns, fries, etc) for diners who are less adventurous. Free green tea and a selection of cheap desserts top off the menu. Excellent value, quick, easy!